worked this piece using oneayeone styled.. I think this one is one of my favorites. I simply adore the colors! Ooo I love this one! Fantastic! 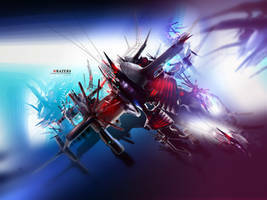 Forms, colors, movement, design - all wicked! Amazing work. My only complaint is that some parts look amazing, while others look low quality - like the bottom orange bar. Other than that, it's simply stunning. Keep up the fantabulos stuff!!! Very beautifull choice of colours, well blended. And try not compressing the .jpg the next time, the gradinent on the background looks too grainy. Or it's supposed to look like that? thmx, yeah the bg was meant that way for fun. i hear yeah and i am working on uping to a bigger res. this piece was made with c4d and pscs2. as for time not sure but not to long . out bigger res wallpapers since alot have mentioned about size. at video games maybe ..
deep to deep ... I like it. i was ina deep peyote trance during its creation .. I can't say anything except for WOW. The colors just pop and are vibrant. I love the compostion and everything about it. Its my new desktop wall. thnx bud, love feels better with choclates, lol..